Edition 45 of THE PROG MILL, first broadcast on Progzilla Radio Sunday 5th March, is now ready to download or just listen to any time you like. This weeks show has 2 hours of superb progressive rock from Touchstone, Comedy of Errors, Kaprekar’s Constant, Steve Hughes, IT, King of Agogik, Mostly Autumn, Encircled, The Room, Transatlantic, Kompendium, Marillion and Anubis. 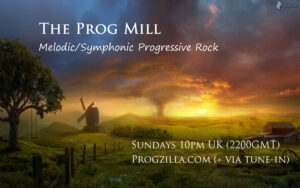 You can hear THE PROG MILL on Sundays between 10pm and midnight UK time (2200-0000 GMT)on Progzila Radio. Repeated Tuesdays at 0400 and 2300 GMT. With the podcast usually available early each week to listen to anytime.